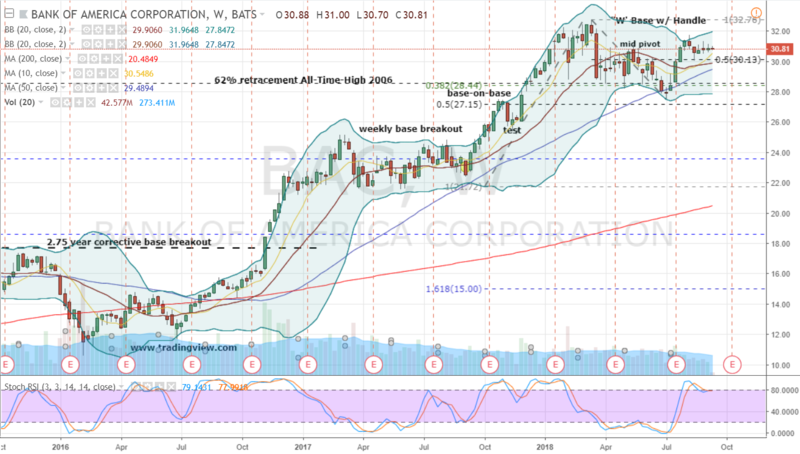 A technically incarcerated Bank of America Corp (NYSE:BAC) has been a model prisoner of sorts on the price chart in 2018. And with a pair of anticipated positive reviews by Wall Street looming, a moderatel, but well-placed bullish butterfly in BAC stock looks well-suited for the occasion. Let me explain. BAC stock has served its time this year with a behind bars performance of just 5.5% that’s lagged the S&P 500’s gain of nearly 8%. But Bank of America’s relative weakness is expected to make a change for the better in the coming weeks. Bottom line — and top line for that matter — the back-winds of a positive rate environment should continue to improve Bank of America’s already solid fundamentals as InvestorPlace’s Robert Martin recently noted. This should make BAC stock a lower-risk investment worthy of most people’s portfolios. And so, in anticipation of BAC receiving a technical pardon from Wall Street courtesy of either the FOMC’s interest rate authorities later this month or earnings in mid-October, risk-averse investors can use a limited and reduced options spread combination today. There’s been a couple head fakes along the way, but by and large BAC stock’s consolidation of the past several months has been well-spent and well-behaved. Over this period shares have corrected 16% and formed a slightly irregular, bullish “W”-patterned base. For the past seven weeks, BAC has put together a tight handle contraction. The constructive price action has found support off the larger base’s 50% retracement level and the W’s mid-pivot. The overall bullish price action is expected to resolve itself with a breakout of the handle followed by a move to fresh highs in BAC stock. If I was to put a number on it, $33 to $35 over the next couple to few months looks reasonable. There’s a good chance either late September’s FOMC meeting or next month’s earnings will provide the initial catalyst for higher prices in Bank of America stock. Yet, sometimes difficult price gaps associated with the news or even an anticipatory Street in front of either event means positioning today with less risk using BAC stock’s options market is a welcome consideration. Given our moderately-bullish outlook for BAC stock, a moderately-bullish long call butterfly looks interesting. With shares currently around 30.80, one favored combination is the October $30 / $32 / $34 call butterfly for 70 cents. That is, buying one set of contracts each for the $30 and $34 calls while selling two sets of contracts for the $32 call. This particular butterfly allows bullish traders to position for the FOMC meeting and earnings and maintain BAC stock exposure of just 2.34%. That’s a nice insurance policy. Regarding the strategy’s potential ‘bank’, this butterfly is already narrowly in-the-money, but enjoys a sizable profit range from $30.72 all the way up to $33.28. This spread is also structured to allow for a modest breakout into the low end of our expected price range. But with $1.28 in profit if BAC lands on $32 at expiration next month, this trader will know firsthand why a bit of extra jail time has its benefits too. The post Why $32 Looks So Great for BAC Stock appeared first on InvestorPlace.